Wolves and coyotes are generally not a threat to humans. Wolves are secretive, usually once a wolf has detected a human it will run away without the person even knowing it was there. Wild coyotes are naturally curious animals, however, they are timid and will usually run away if challenged. Coyotes start posing a risk to people when they lose their wariness and become comfortable around humans - this is usually a result of direct or indirect feeding by humans. • Scare away approaching predators: Do not run away. Use stones, sticks, rocks, loud noises, waving arms and aggressive yelling while maintaining eye contact. • Create and maintain space. Give wildlife lots of room to avoid you, never crowd around them. • Do not stop to take pictures. • Never feed wildlife. Avoid food-conditioning wolves or coyotes by securing all food and garbage. • Prevent conflicts. Give all wild animals distance, not food. Avoid hiking alone. Keep children close. • Be predator aware. Understand and watch for wildlife warning signs. • Be informed and inform others of current information. • Be prepared for an encounter. Carry deterrents such as noise makers, sticks, or bear spray, and know how to use them. • Respect all wildlife and their right to be here. 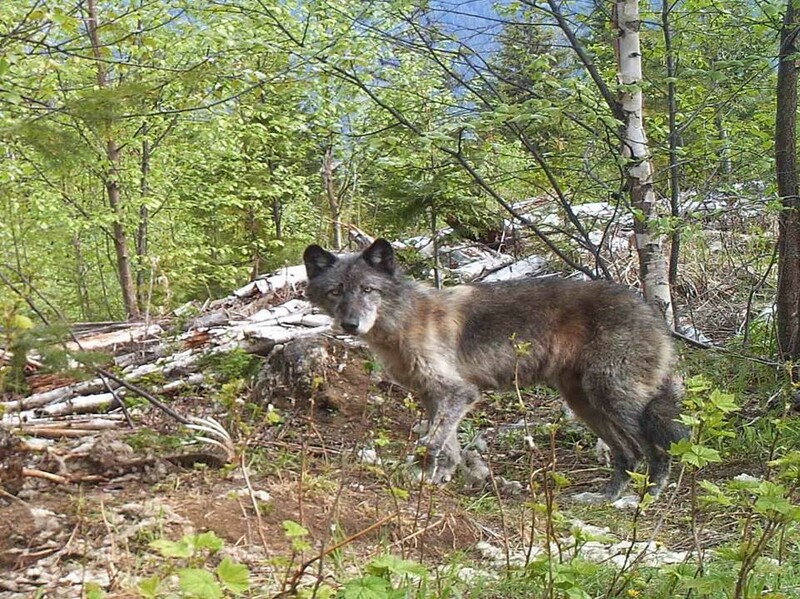 It is not normal for wolves or coyotes to attack or pursue humans, especially adults. Aggressive behavior toward humans by wolves or coyotes is usually the result of the animal becoming conditioned/comfortable with people as a result of direct or indirect feeding. If a wolf or coyote is spotted in an urban or rural area it is recommend to keep children inside until the animal has left the area or to pick children up and carry them. The animal was likely just passing through. Children shouldn't be left unsupervised. Also refer to pets if applicable. It is an offence under section 33.1(1) of the Wildlife Act to feed dangerous wildlife. Report via 1-877-952-7277 or anyone that is feeding or intentionally attracting dangerous wildlife. If you are concerned about an encounter or about encountering aggressive wolves or coyotes, keep a deterrent handy. Deterrents could include: rocks, sticks, banging pots and pans, tin cans filled will rocks or pepper spray (may not be an option in an urban setting). If a wolf or coyote approaches you:make yourself look as large as possible - if sitting, stand for example. • Wave your arms and throw objects at the wolf or coyote. • Shout at the wolf or coyote in a loud aggressive voice. • If the wolf or coyote continues to approach don't run or turn your back. Continue to exaggerate the above gestures and slowly move to safety. • Pets should be kept leashed and under control at all times. Don't allow a pet to chase/pursue wildlife (it is an offence under the Wildlife Act). • Don't allow your dog to play or interact with wild canids. This will allow wild canids to become comfortable around humans and their pets. • Removing attractants will reduce the probability that predators will visit or hang around residential properties. Report to COS Call Centre (1-877-952-7277). If a wolf or coyote has acted aggressively or displayed aggressive behaviour towards a human or pet report to the COS 1-877-952-7277. Call the COS Call Centre if a wolf or coyote poses an immediate threat or danger to public safety.